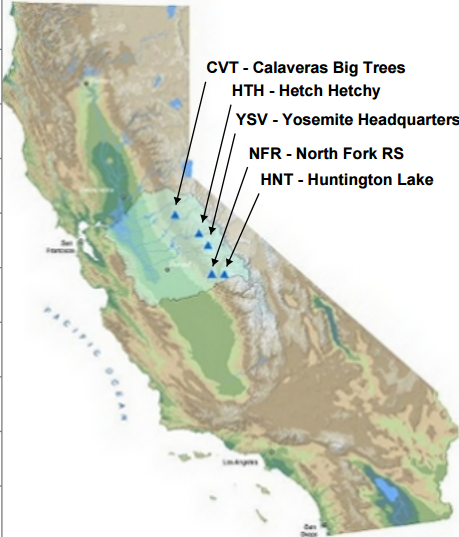 Summary: With the periodic reoccurrence of El Niño there are efforts to try and assess what the impact will be on California, especially the state's water supply. 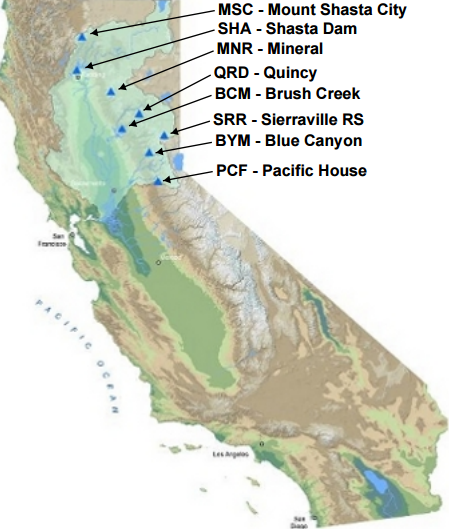 This project examines the precipitation for warm ENSO events across California. Overview: El Niño events have are defined from the Oceanic Niño Index (ONI) into Weak, Moderate, Strong and Very Strong events. Then the seasonal (July 1 through June 30) percent of normal precipitation for each category, plus a collective category of "all" warm events, was collated for a number of cities and geographic areas. 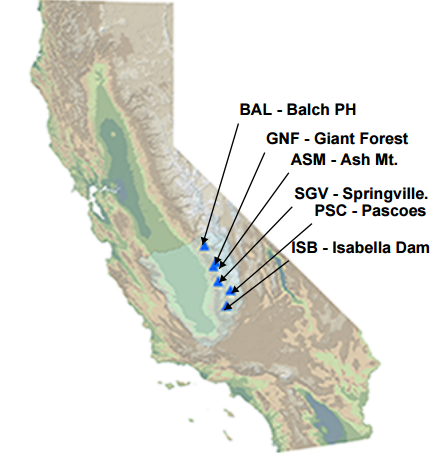 These include three major watersheds, the Northern Sierra Nevada Eight Station Index (8SI, map), the Southern Sierra Nevada Five Station Index (5SI, map) and the Tulare Basin Six Station Index (6SI, map). Additionally the seven NCDC climate division (see map) and the entire state of California (CA) averages were compared to the ENSO events. These comparisons was done in terms of both average seasonal precipitation and also the number of occurrences within percent of normal categories. Observations: The best "signal" associated with warm ENSO (El Niño) events is, as would be expected, with the "Very Strong" events all at least 140% of normal except for Climate Divison 3 which was between 120% and 140%. In the "Strong"category Southern California showed a significant positive signature with the three seasons categorized as strong, all averaged above normal precipitation with the highest percentages of normal (PON) in Los Angeles, Climate Divisions 6 and 7. During weak and moderate warm events there is no such signal with the number of years of above and below normal being fairly evenly split statewide. Also: United States El Niño Winter Preciptation & Temperature Climatology for a graphical display of warm ENSO events for the entire United States from 1950-51 through 2016-17. Important Caveat: The data presented here is a climatology of past events and is made up of a broad range of events from a small sample that are averaged together. Consequently, like all averages, this type of data should not be used as a forecast! 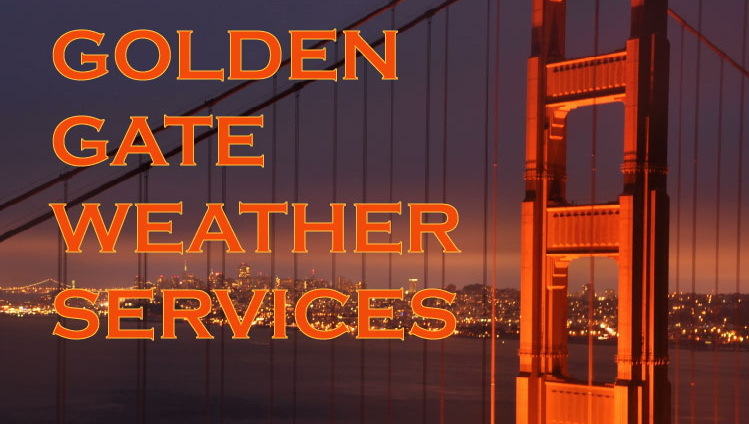 Copyright © 2018, Golden Gate Weather Services.